Every time I try a new type of session I fall in love and that becomes my favorite type of session to shoot. So who can guess what my current favorite session type is now? The design of the tub we used for this session presented some challenges that we had to work around. 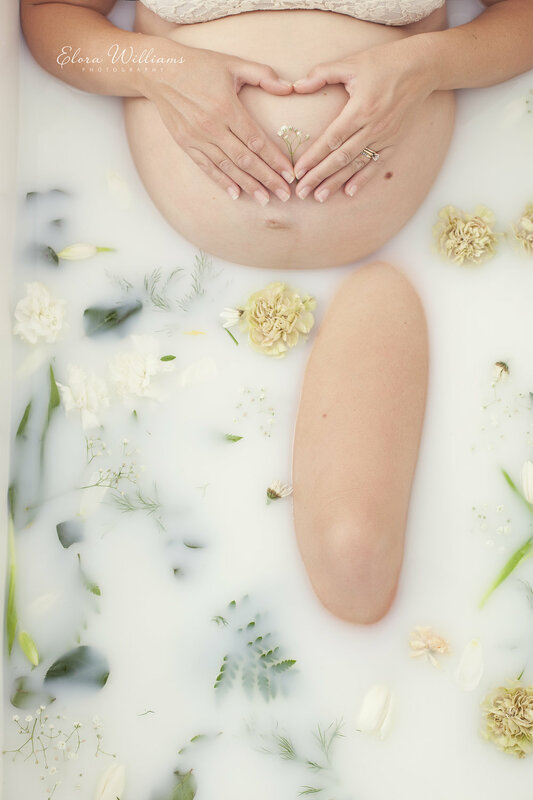 However, I am so in love with how the images turned out and can't wait until I get to photograph another pregnant mama in a milk bath! These lace outfits were perfect! If you are interested in planning a milk bath session with me give me a call or shoot me an email. I would love to work with you! I have had such a wonderful few weeks getting to know this incredibly friendly family. When I first spoke with Christina I knew she would be just as passionate about her session as I was. We discussed doing an outdoor family session, as well as doing a more intimate milk bath session. I was so excited because not only did I get to try photographing someone in the snow for the first time, but I also got to try my hand at a milk bath! I will be sharing the milk bath images with you next week so make sure you check back then! For the location of our outdoor session Christina recommended an amazing park with beautiful trails. We even saw some deer tracks however we didn't get to see any around the time of our session. We spent time taking pictures of the family before splitting off to get some beautiful pictures of Christina on her own. Isn't this just the cutest! He wanted to give the baby flowers, sigh. I definitely have a love for winter photography and having such an amazing family to experience it with for my first time has only increased my love for it! I love working with couples who have a good sense of humor! Tina, I will be visiting again soon to get my hands on your little one! I am very grateful for the opportunity to photograph Kristi and Wendell during this special time in their life. I am excited to see the little family they will become and to watch them grow as parents. The weather leading up to the time of the session was horrible and I was worried we would have to postpone. However, it cleared up and turned out to be a beautiful evening. Kristi was a trooper and at times was walking around in heels! I don't know what pregnant woman wants to do that, let alone while carrying twins!